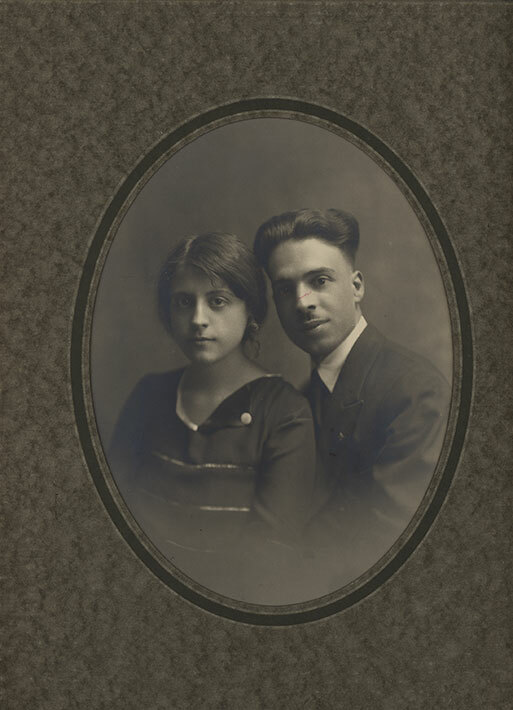 Photograph of Lina and Luigi Pancaro, North Bay, ON, ca. 1930. Although the couple met in North Bay, ON, they later settled in Sudbury, ON and raised a family. Luigi Pancaro was a surgeon, trained in Italy. He was a supporter of fascism -- believing it had improved the socioeconomic status of most Italians. On June 10, 1940 he was arrested as a threat to the Canadian state. While interned at Camp Petawawa, he worked at the camp hospital, providing medical care to fellow internees and on occassion to camp guards and officials. Left at home with five children to support, Lina did her best to manage. She rented out parts of the Pancaro family home and did chores to which she was not accustomed such as putting coal in the furnace. After petitioning the Custodian of Enemy Property, Lina was able to access monies made from the sale of Sistosan, a medicine that hindered bleeding and invented by her husband.